Some background: Pelletier is the organizer of the Eliot Loungers Relay entry, which he annually touts ad infinitum, including a big spread in the Cape Cod Marathon program. The absolute best the Loungers have ever produced is a 6th place finish last year. To an eternal optimist like Russ, this may smack of victory, but up the Leader Board were two NER All Star teams in the 2-3 position and on the women’s side, the Super Senior “Fitzy’s Frisky Felines” squad placed 4th among women’s teams after winning it all the year prior. The Newly named NER All Star “Strike Force 40” team won in 2007-2008 before being outkicked on the final leg last year by the new NER sponsored “Fading After 50” squad. 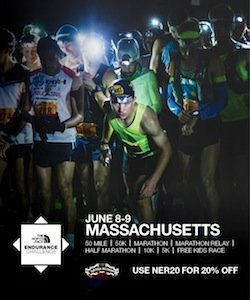 Both teams will be looking to chase down the New Balance Habitat 1 defending champions led by Cape speedster Joe Navas. There is also reference in the video to the Mimi Fallon led brigand of mercenaries that won the women’s division last year.